Remember that cat sweater I was knitting? Here it is! 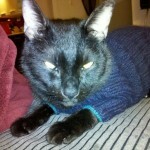 The cat looks super evil and pissed off, I can only imagine for reasons that are totally unrelated to his sweatering.